Sometimes you discover an activity that is perfect for your child in every way. It can be a very rare occasion, but when you find it, you have to just do it. 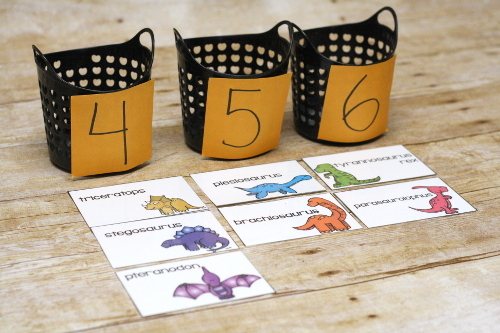 Logi-Bear loves dinosaurs, wants to learn to read, has been enjoying sorting into syllable “teams”, and really likes having little cards and booklets that are just for him. 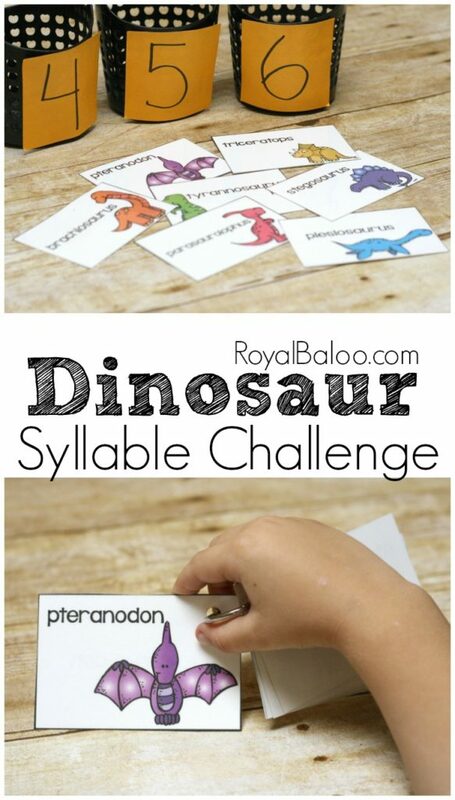 When the idea of a dinosaur syllable challenge popped into my head, I knew it was just perfect. In case you missed it, I am collborating with the great Cassie from 3Dinosaurs.com for all of October! 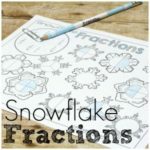 We are working on tons and tons of printables just for you guys! Well, okay we use them too. But our reasons aren’t purely selfish. Anyway, don’t miss all the great printables! You can see the current list at the 31 Days of Printables in October page. Or you can sign up for the once a week e-mail newsletter. Or both. Really, it’s up to you! 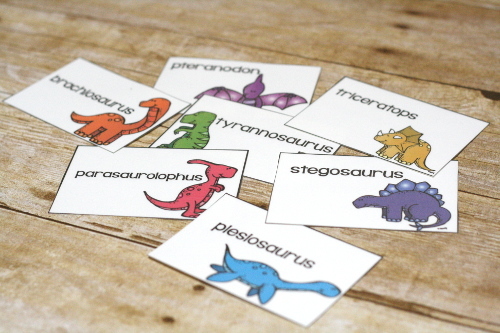 Dinosaur names are known for being difficult to say but for some reason, kids have very little trouble learning their exact pronunciation. In fact, I’d say kids know more about dinosaurs than adults in almost every case. Baloo likes dinosaurs too and schooled his dad on a debate about dinosaurs. It was highly entertaining, well for me at least. 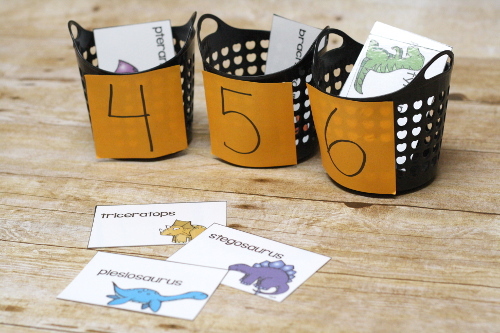 I figured an activity that combined a love of dinosaurs into anything would be a hit. Logi-Bear (5) started worked on syllables about a month or so back. He really enjoyed separated words into teams, especially our family. Our immediate family is all two-syllable names but when we go out to aunts and uncles and cousins, we get a bit more variety. He was tickled that his uncle and our cat are on the same syllable team. There are seven different cards with a different dinosaur on each. The front has a picture of the dinosaur and the name of that dinosaur. They range from 4 to 6 syllables. I made little sorting buckets just for curiosity’s sake. The back of each card (if you print double sided) had the word separated into syllables (and loosely a phonetic spelling). HOpefully this will help some of us old-timers figure out the right pronunciation! If you’re not sure, just ask your child. They probably know! I printed ours on cardstock and also laminated them. I know these will be used a lot. To keep them in order, I also hole punched them and put them on a little ring. We end up using these little rings a lot because he loves having little rings of information. The bookmarks from 3 Dinosaurs are a bit hit on the rings! He insisted this is a pterydactyl but it’s his favorite. Before we put them on the ring we did a simple sorting activity. We clap syllables or do the hand on the chin test. Then we added them to the correct basket. 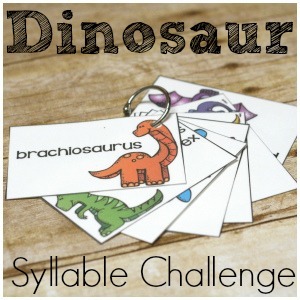 Download the Dinosaur Syllable Challenge Cards! I can’t believe we are already 10 days into the month. 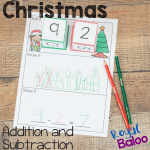 There are still 21 days of printables left! If you don’t want to miss any of them, sign up for the once a week e-mail updates! There might even be an extra printable coming to the list as a small ‘thank you’!